Welcome to our Holiday issue of The eBullet! Here's what's going on the rest of this year and into next year. 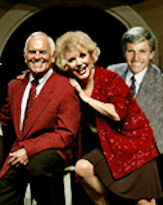 Ronnie Schell and Ruta Lee (both in red)) are flanked by Senior Class costar Gary Collins. * Dec. 11: Release date for the Complete Third Season of "Gomer Pyle, U.S.M.C." on DVD. Pre-orders are underway now at our Weaver's Dept. Store online. * June 28 & 29: James Best appears at DukesFest at the Atlanta Motor Speedway. Visit http://www.dukesfest.com for more info. * July 5: Doug and Rodney Dillard and their band perform at the 22nd Annual Sally Mountain Park Bluegrass Festival in Queen City, Mo. They will also be doing a special workshop at 11 a.m. called "Stories of Mayberry." For more info, visit http://www.sallymountainshow.com. * July 9: Jim Nabors is in concert at the American Music Theatre in Lancaster, Penn. For more info, visit http://www.americanmusictheatre.com. * July 12: 8th Annual Mayberry Squad Car Nationals in conjunction with the 4th Annual Mayberry Comes to Graysville festival in Graysville, Ala.
* July 19: Tentative date for a tribute event to Don Knotts in Morgantown, W.V. *Aug. 9: Doug and Rodney Dillard and their band perform at the Second Annual Mayberry in Troy, a fundraiser for the Montgomery County DARE program in Troy, N.C. Showtime is 7 p.m. More details TBA. * Sept. 25-28: 19th Annual Mayberry Days in Mount Airy, N.C. Stars confirmed so far include Doug Dillard and Rodney Dillard. For more info, visit http://www.surryarts.org. 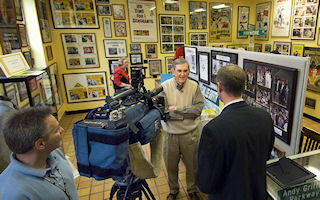 Emmett Forrest is interviewed during the opening of the exhibit of his Andy Griffith memorabilia at the Andy Griffith Playhouse in Mount Airy. 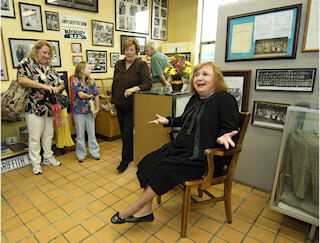 Betty Lynn looks right at home as she greets fans with memories and a smile during the festive opening of the collection at its new home. Emmett Forrest's phenomenal Andy Griffith Collection of memorabilia has a new permanent home at the Andy Griffith Playhouse, the former Rockford Street Grammar School that Emmett and Andy both attended in Mount Airy, N.C.
Emmett's mission was to have the collection on display where it would always be free of charge to the public. When plans stalled for a new Mount Airy Visitors Center (also to be on the Playhouse grounds), the Surry Arts Council made space available for the collection in the existing building. It's a very happy home for Emmett's collection. To the right are a couple of photos by Hobart Jones from the ribbon-cutting in October. 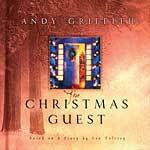 Andy Griffith provides the voice of Santa Claus in the animated Christmas Is Here Again. The film has an all-star cast including Ed Asner, Shirley Jones, Kathy Bates, Norm MacDonald, Brad Garrett, Dan Roebuck (who also is one of the producers) and Jay Leno as the narrator. It may make it on TV this holiday season (that possibility was still pending as we were sending this out), but at the very least, it'll be out on DVD for next Christmas. On Oct. 8, Andy started filming an independent film called Play the Game. The movie also features Mayberry's Rance Howard and Clint Howard, as well as Doris Roberts (Ray Romano's TV mom), Liz Sheridan (Jerry Seinfeld's TV mom), Paul Campbell ("Battlestar Gallactica"), and Marla Sokoloff ("The Practice"). The film is slated for release in theaters next year. Rance Howard also appears as a preacher in the big Sony Pictures release Walk Hard-The Dewey Cox Story, which will be in theaters Dec. 21. And he has bunches of other movie roles in the works, as does Clint. Ron Howard is currently in post-production for the film version of Frost/Nixon, based on the hit play about David Frost's interviews with Richard Nixon after he resigned. Ron is also producer of The Changeling, which is being directed by Clint Eastwood and stars Angelina Jolie. And Ron is in pre-production as director for Angels & Demons, the sequel to The Da Vinci Code that also stars Tom Hanks. The film is slated for release at Christmastime of next year unless the writers' strike interferes with the production schedule. 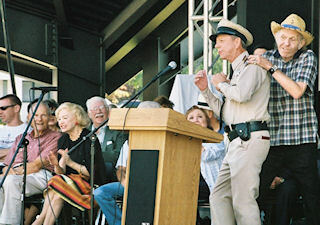 GOTCHA!—Doug Dillard ambushes David “Mayberry Deputy” Browning during Mayor’s Proclamation ceremonies at Mayberry Days. Among those looking on are Elizabeth MacRae, George Spence and Betty Lynn. 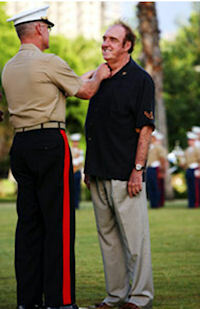 Jim Nabors was promoted to Honorary Lance Corporal in the United States Marines during a ceremony in Hawaii on Sept. 25, the 43rd Anniversary of the first episode of "Gomer Pyle, U.S.M.C." George Lindsey received the first-ever ICON Award from the Nashville Association of Talent Directors at the group's annual breakfast meeting on Oct. 17 at the Wildhorse Saloon in Nashville. Sal-luuute, George! George also was interviewed by Ralph Emery on the Oct. 8 installment of "Ralph Emery Live" on the RFD-TV Channel. James Best plays McClancy in Moondance Alexander, which has been in theaters since opening in limited release Oct. 19. The film, written and produced by James' daughter, Janeen, and her husband, Michael Damian (who also directed), has already won an award at April's Newport Beach Film Festival. The 18th annual Mayberry Days in Mount Airy was a big success with TAGS stars Betty Lynn, Maggie Peterson Mancuso, Doug Dillard, Rodney Dillard, James Best, Jackie Joseph, Elizabeth MacRae, LeRoy McNees, George Spence, and David Morris (son of Howard Morris) in attendance and thrilling the large crowds throughout the weekend. LeRoy McNees was joined by Keith Thibodeaux and several popular Mayberry tribute artists for Cruise to Mayberry 2 in the Caribbean. It got wave reviews! After the cruise, LeRoy and wife Jan stayed in Florida to help build a house for Habitat for Humanity. And Margaret Kerry (two episodes of TAGS, including "Christmas Story") has just returned this month from a Disney cruise to the Caribbean. Her autobiography, Tinker Bell Talks, is expected to be released in early 2008. Joy Ellison, another "Christmas Story" cast member (as Effie Muggins), continues to stay busy as one of the top dialect coaches in Hollywood. She regularly works with Catherine Zeta-Jones, including on this year's No Reservations. She is currently working on The Mummy: Tomb of the Dragon Emperor, which is set for release in August. Lots of events involving TAGS stars are beginning to take shape for 2008. It promises to be another fun year in Mayberry! 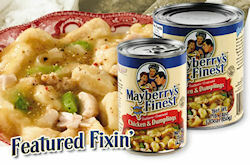 The new line of Mayberry's Finest packaged foods from Diversity Brands won't be on our shelves at Weaver's Dept. Store, but only because we're not exactly set up for cost-effectively shipping cans of beans and, eventually, jars of pickles. 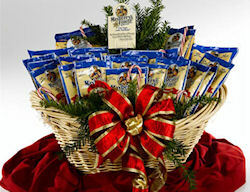 However, the full line of canned goods and baking mixes (including special gift baskets like the one at left) is now available on the Mayberry's Finest Web site at http://www.mayberrysfinest.com. The foods also are starting to hit the shelves of grocery stores across the country. Their Web site has an up-to-date list of stores and locations in its Foley's Market section. Keep an eye out for Mayberry's Finest at your favorite store. If you don't find the line in the store where you shop, ask the store manager if the store can stock the items for you and others. On their site, you can also listen to their catchy new jingle by the 2006 and recently re-crowned 2007 International Bluegrass Music Association Entertainers of the Year, The Grascals! Also, if you happen to be in Nashville on December 7, look for the Mayberry's Finest squad car in the city's Christmas parade going down Broadway at 7 p.m. that night. And one last note about Mayberry's Finest...they have a page on MySpace at http://www.myspace.com/mayberrysfinestfoods. If you're a MySpacer, drop by and tell 'em hey. "If a Duck Stands Still, You Can Catch Him by the Bill!" Bedford, Va.
That brings our total number of chapters founded to 1,321. If you're interested in starting a chapter of TAGSRWC, all you need to do is pick a name that has not already been chosen, and submit it with a list of your founding members by postal mail. What you do as a chapter is entirely up to you. Your group can do as much or as little as you like. Or write to us also if you would like to contact a chapter near you. Our address is TAGSRWC, 9 Music Square South, PMB 146, Nashville, TN 37203-3211. As we head into the holiday season, here are some of our newest Mayberry items at Weaver's Dept. Store at http://www.iMayberry.com. Elizabeth MacRae and husband Charlie Halsey are ready to proceed in the Mayberry Days parade. And there's also a Box Set of the Complete First Three Seasons of "Gomer PYle U.S.M.C" coming out the same day. The suggested retail price for the Box Set is $120.00, but we've got 'em for just $90.00! And we still have a good supply of the Complete First and Second Seasons of "Gomer Pyle" sold individually at our introductory price of $32.00. Like the Third Season, they're 20% off the suggested retail price of $40.00. This DVD will be released on Nov. 27. We're taking pre-orders now. This hit independent film of 2007 features Andy as Old Joe, a crusty diner owner. It also stars Keri Russell. There's a lot of wholesome pie-making in this romantic comedy, but there are also some mature themes that give it a PG-13 rating. The suggested price is $30.00, but our price at Weaver's is just $25.00. This fifth straight year of an officially licensed TAGS Wall Calendar celebrates that milestone with all color photos for 2008. Now, don't panic. "all color" doesn't mean photos only from the color seasons. Several photos are from the black-and-white era. They just happen to be in "glorious color" because they are publicity stills. Some haven't been published since the first set of trading cards in 1990. We also have a Calendar Combo with both the 2007 and 2008 Wall Calendars for only $22.00. The suggested retail price for this Box Set of every episode of "The Andy Griffith Show" (plus the "Danny Thomas" pilot episode and the 1986 Return to Mayberry movie) is over $240.00. The previous 8-season box-set release (without the pilot and the movie and now also discontinued) carried a suggested retail price of $320.00. We think our $192.00 price is an exceptional value. We also sell individual Complete Seasons on DVD at very nice discounts. This brand new board game is a dream come true for "Barney Fife, Realtor" and anyone who has ever wished to own a little piece of that paradise we know and love as Mayberry! 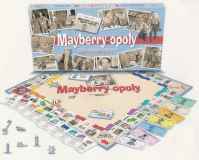 If you love Monopoly and Mayberry or you know somebody who does, then you'll really love Mayberry-opoly. At just $30.00 per game, Mayberry-opoly is worth the price just to have the cool design of the box and the board to look at or display. We think it's the most fun opoly game ever created. Step aside, Harry Potter! Darling boy Mitch Jayne's fascinating new novel, Fiddler's Ghost, has just been released. It's absorbing reading for anybody who loves a good ghost story, music, skillful writing, or just plain great storytelling from a true master. Few people have as much of a command and appreciation of language (especially the Ozark variety) as Mitch. We don't want to give away the plot, but we will say that it's a charming, entertaining and engrossing tale. We also have our phone order line available for shopping convenience. The number is (615) 604-1298. Our phone line has part-time hours. It is generally manned Mon.-Sat., 9 a.m.-6 p.m. CT, but there will not always be somebody there even during those times. However, you can always leave a message 24 hours a day and we'll call you back "on our nickel" to get your order at a time convenient to you. And of course you can always order online or by mail any time. You can find most of our items at our location on the third floor of the Main-Oak Emporium at 245 City Hall Street in Mount Airy, N.C. We'll have our shelves especially well-stocked for the holidays. As usual, the big chapter event for year was Mayberry Days in Mount Airy. Members of at least five dozen chapters were on hand. We finally stopped trying to count chapters because Ernest T.'s feet got tired. Fans from more than 30 states turned out for a perfectly beautiful weekend chockfull of activities. 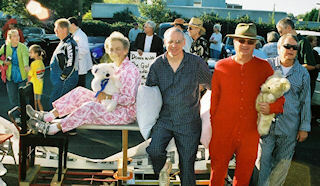 ADVENTURE SLEEPERS—Neal Brower would probably prefer that we not mention the names of any Barney Chapter members dressed in silly pajamas for the Mayberry Days parade, so we won’t. And our editor especially won’t mention whose mother might be the one on the ironing board (Hi, Mom!). So, we’ll just mention that among those passing by in the background (and pretending not to notice this sleepy group) are Jim “Vip” Vipperman, Allan “Floyd” Newsome, Paul “Regis” Gustafson (with sign), Doug Dillard and Jeff Koontz. 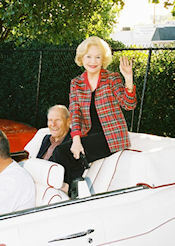 Some of the highlights of the weekend were concerts by The Dillards with special guests Maggie Peterson Mancuso and LeRoy McNees, an art exhibit by James Best, Neal Brower's lecture with Jackie Joseph, and participation by all the stars and tribute artists in the parade and Colonel Tim's Talent Time. 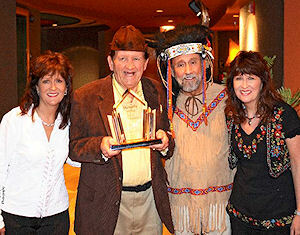 Two major TAGSRWC awards were presented during our Annual Meeting on Saturday. First, the Mayberry Friendship Award was presented to Pat and Neil Coleman of "Remembering Mayberry" chapter (Chillicothe, Ohio). Pat and Neil are longtime members who attend and support numerous events every year and constantly help out behind the scenes as well. The other award presented was the Jim Schwenke Memorial Award, which this year was given to Doug Brewer, leader of Mayberry Minutemen chapter (Graysville, Ala.). As you might guess from the chapter's name, it's one our oldest chapters. Lately, Doug, who is currently mayor of Graysville, and the chapter have been hosts of the Mayberry Comes to Graysville festival in conjunction with the Mayberry Squad Car Nationals. Congratulations to Pat, Neil and Doug on their well-deserved honors! A sad footnote to the awards: We got word after Mayberry Days that Alice Schwenke, widow of Jim Schwenke, passed away in July. Since a lot of folks knew both Jim and Alice of the Mayberry Texans chapter in Houston, we wanted to share this news. In other news from Mayberry Days, the "Who's Been Messin' Up the Bulletin Board?" chapter's Silent Auction raised $2,267 for the Surry Arts Council. Woo-hoo! The annual fundraiser helps the Arts Council put on Mayberry Days. At its August meeting, Wally's Front Porch chapter (Wilson, N.C.) had its "tricked out" truck (which was created for breast cancer awareness) on display. The truck was also featured on CMT's "Trick My Truck" show. Mayberry chapter (Knoxville, Tenn.) has had a steady schedule of activities and meetings the last few months. One of their largest was when about 200 people attended the TVA&I festival. The chapter hosted a Mayberry trivia contest and had character look-alikes and squad car replicas on hand. The chapter also recently celebrated Jackie Joseph's birthday with a chocolate cake and phone call to Jackie. Miss Crump took a break from quizzing in the last issue in deference to the Mayberry Days Trivia Contest in Mount Airy. By the way, that intensely competitive contest was a tie this year with Champion trophies going to two perennial Mayberry trivia dynamos, Pat Bullins and Dennis Beal. Congratulations to both! * A person making reference to egg or eggs can only be used one time, even if the person makes reference to egg or eggs in different episodes. * Only one egg can be counted per instance. So, for example, if you see a plate of scrambled eggs and a dozen eggs in a carton in a scene, that counts as only one egg reference. * And the same egg or eggs seen or mentioned by more than one character in different situations counts as only one egg reference. You'll probably find that there is no shortage of egg references on the show, but you may have to use some strategy about how you claim each instance of egg in order to maximize your egg count. Submit your answers by e-mail to OldLadyCrump@iMayberry.com or, if you just don't trust a computer with your entry, mail your answers to TAGSRWC, 9 Music Square South, PMB 146, Nashville TN 37203-3211. All entries must be e-mailed or postmarked by January 12, 2008. Happy hunting! (Cockle-doodle-doo!) And, even if you're not entering the contest, good luck trying not to notice every time eggs are seen or mentioned on the show from now on! Between issues of The eBullet, keep up with the goings-on in Mayberry with the daily "Who's Been Messin' Up the Bulletin Board?" Digest. It's a free subscriber list that consists entirely of comments, newsflashes, and questions and answers from subscribers. You can sign up for that list by going to the "Mailing Lists" link at http://tagsrwc.com. TAGSRWC's other main vehicle for Mayberry information is simply our Web site at http://www.tagsrwc.com (and it's nearly identical sister site http://www.iMayberry.com. 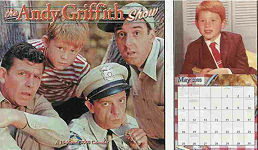 Both sites have extensive content and links for just about everything a Mayberry fan might be looking for. The next issue of The eBullet is scheduled for late January, with a Weaver's Newsletter planned for December.